Fire Prevention Week will be here soon. Lowes Build and Grow Clinics allow you to work on a project with the kids. Bring the kids into any Lowe's store and build a FREE wooden project. Each participant also receives a free apron, goggles, a project themed patch and a merit certification upon completion of their project. 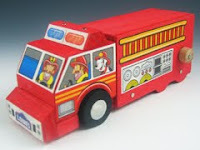 This Saturday, Sept. 26 the project is a fire engine. It looks really neat. For more information and to sign up for this project, go to www.lowescreativeideas.com.